The Pages Tab shown above features five basic page layouts that can be applied to any Design. 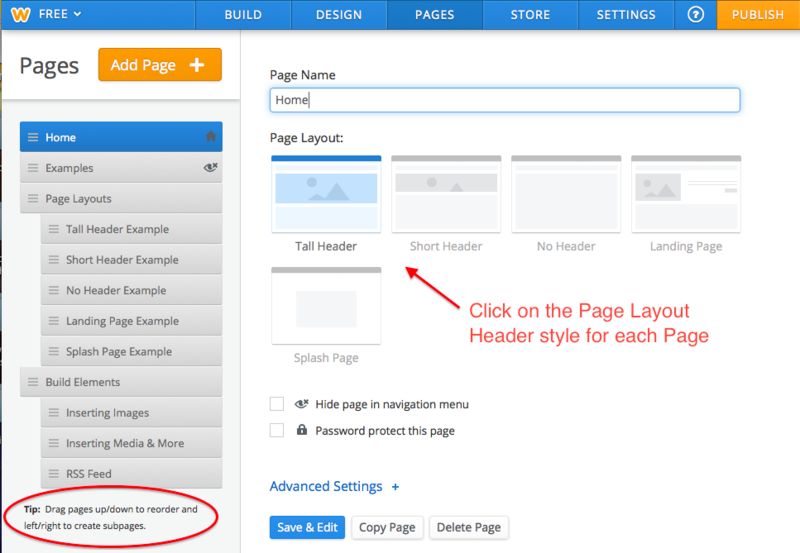 The Tall Header Page Layout in Weebly is a good fit for main pages or prime sections of your site. This Page Type uses a tall banner, giving you plenty of room for graphically representing your content. The Short Header Page Layout can be used for your internal pages or the pages in sub-menu that are part of a parent category. The narrow header image can be used without taking away the attention from the main information that follows. The No Header Page Layout has no banner image. If your page has other graphic elements or Video embeds, then a banner image could be distracting and conflicting. The No Header Page Layout would be a better choice for those situations. The Landing Page Layout is best suited for your Home Page. It is good for drawing attention and made for Call To Action. The Headline conveys the most important aspect of your website and the included button can lead your visitors to the right place. The Splash Page Layout is similar to a Landing Page but no content can be placed below the header image.